The crisis is not outside a person or in the systems that we’ve created externally; rather, this crisis is inside us. It is first of all in everyone’s understanding of what our real condition is. It “comes” namely from the system that stems from the world of Infinity, which we are beginning to study. Everything is predetermined. We are simply discovering our internal reserves, our inner Reshimot (informational genes). And so we will advance until we discover that we are in a totally new system. In the drawing we can see one system, the second system under it, and the third on top of it. The middle system is us in our ordinary sensations. The lower system is the new egotistic forces that appear in us. But at the moment we don’t clearly feel that they are ours. They appear in us out of nowhere, as if we are controlled by them. There are many theories about this issue, including some cosmic ones. There is another system that seems as opposite from us: the altruistic system, the system of bestowal, connection, the integral system. 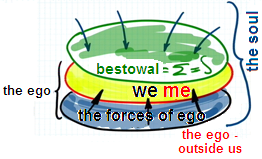 Our egoistic system is opposite to the new system. All these systems are revealed in us, in me. Why did I draw myself “inside myself?” it is because I feel that the egoistic forces inside me are not mine. They begin to appear in me as strangers, as coming from below. On the other hand, I already feel that I have gotten “entangled” with some other system, which isn’t the one I have created. Until today, only the middle part of the system existed for me, the part that is colored in yellow, “me.” I exist. This is me. This is our world, in which we found our way around easily. Everything was all right. Now I see that there are certain thoughts that aren’t exactly mine, and also certain feelings, as well as desires. Why? It’s because I don’t feel that they bring me self-realization, that this is exactly what I need. This is why people escape to drugs, divorce, or different kinds of terror. They don’t feel that it is them. The feeling of my individual “self” disappears. We begin to feel that certain forces (not ours) are filling and pushing us. We feel that our egoism is external to us. It is the force that arrives from the outside. It isn’t me. I am something different. There is something else in me, something natural, and I am simply being loaded with egoistic forces. They irritate me. Thus, I begin to feel that my egoistic forces are not mine, and I call them “the evil inclination”—the evil desires, the malicious desires, the desires that are not mine, that were instilled into me. A person becomes detached from his nature. The “I” begins to identify with the addition above one’s previous nature. He already has the feeling that “I” is not my desires, “I” is not my thoughts. I can detach myself from them, I can rise above them, and I can change them. This is why I have drawn the system as two parts. It is very important because in this form I already begin to see myself as something complex. There is the “I,” and there are my desires and the egoistic attributes that simply exist in me, but I can somehow annul and change them. I am not tied to them at all. As a result of the discovery of “who and what I am,” I begin to feel that at the same time I am in another world. That is, everything around me seems the same, yet something is different, something has changed. I seem to find myself in an environment where there are other thoughts, other feelings, some conspiracy against me. I still don’t get what it is, but I am in a space where there are many different forces, different thoughts, and different ties that flow around me. I feel that they exist, but they don’t touch me. Rather, they only wrap me, and I can’t do anything with them. This is our feeling in the world: It is very clear and leads to clear results.